Finishing your basement is one of the easier home improvement projects because you are tackling an area of your home that is not actively used. In addition, you are extending your home’s square footage living space by converting basement storage space into more room for you and your family to enjoy. At Nuss Construction Company, we have helped many Southern New Jersey homeowners through the basement finishing process. Before you begin a project like this, Nuss Construction will first help with making sure your basement is ready. Why refinish your basement if you have an existing moisture problem? We’ll check for any water problems and address any obvious and not so obvious signs of moisture. Part of this pre-prep process is checking outside around the foundation of your home to make sure the ground is graded away from your foundation. We’ll also look at your foundation and evaluate it for cracks or any types of separation. Depending on where you live, you may have to abide by any number of state, town, local municipality codes. We understand all the ins and outs of building codes, especially as they relate to finished basements. For example, do you want a bedroom in your new finished basement? If so, per safety codes, the bedroom will have to have an egress window. Without proper egress in a basement bedroom, you may not be able to list the room as a “bedroom” should you sell your home. With no problems to address before building, you can now dive into the heart of the project. At Nuss Construction Company, helping our customers design basement living space to their needs and specifications is one of our many strong points. 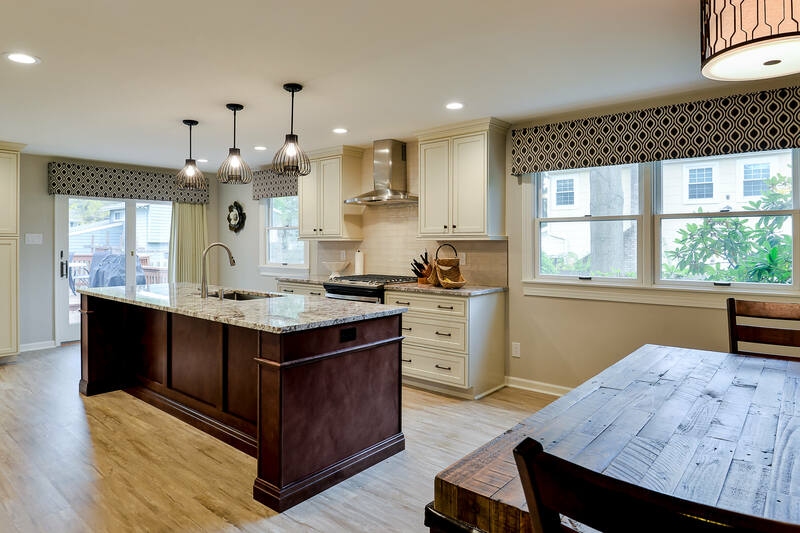 With so many finished basement projects under our belts, we can easily design your space as well as incorporate the latest designs and features of the best remodeled basements. With the design and plans in place, we will implement the Nuss Construction Difference as part of our construction phase. Simply put, we treat your home like it is our own. We employ many different tools and techniques to keep noise and dust to a minimum and protect your existing living area while we work. Get the most out of your home improvement investment dollar by calling your local basement finishing experts at Nuss Construction Company today at (856) 452-0551 to schedule a no-obligation consultation. We absolutely love our bathroom and the entire renovation. It is so inviting, stylish and functional. A week doesn't go by where Melissa doesn't tell me how much she loves her closet. Thanks again to you and your team for a fantastic job. I want to let you know HOW FANTASTIC CHERYL was with regards to her first phone call contact, the questions Cheryl asked, how well she LISTENED to what we wanted, and then how polite she was on the follow up phone call to confirm my appointment. I can't imagine a better face for your company when people first reach out to Nuss Construction. Had the first floor bathroom completely redone. From beginning to end my hand was held with design, suggestions, and planning. The actual construction was done by very professional craftsmen who respected my home by treating it as their own. They even enjoyed my dogs. Great job from start to finish. Very professional and responsive, skilled craftsmen, and a real pleasure to work with. Would definitely recommend to family and friends. They did a beautiful job transforming out home from a somewhat dated look to a home that we are proud of. Thanks to John, Mike, Ron, Rich, and everyone at Nuss! We like to keep our business local and had heard about Nuss Constuction in Marlton. John Colaianni was personable and helpful and was with us throughout each phase of the project. Hector was the crew leader and did a fantastic job. Subcontractors from the Paint and Wallpaper Co were thorough in their process. All the workers were a pleasure to have in our home and the end result is just what we had hoped for. We recommend Nuss to our family and friends. We've asked Nuss to do work for us in the past and given our experience, the decision on who to call was a no-brainer. We decided to go ahead with a new roof and kitchen face lift. We also had a few new doors hung, These guys were right on the mark with our budget conscious project. John Colaianni was a top notch Project Manager and Ron Vukicevich (Lead Carpenter) was more than accommodating to our needs. Both John and Ron were always on time and were great with communication. Plus, our dogs loved these guys. That's almost good enough for us. Based on our experience, we'd readily recommend these gentleman. I want to thank John Colaianni, Rich Lombardi, and Mike Girgenti for the excellent job on the installation of the doors and the handrail. Gail and I are very pleased with the results. I was not sure who to have install my new front door until I met John from Nuss. He took the time to review every detail of the job and instill the right level of confidence. Now that the job is complete, I have to say how incredibly pleased I am with the work. Hector did an amazing job and I could not be happier. He is a real craftsman and I would have no hesitation in using Nuss again -- as long as Hector did the job!! Thank you John, Rich and Hector for a job well-done!! David was my "go to" person within Nuss - and he was amazing! I give the Nuss name to everyone when I hear they need work done to their home. Thank you for making a stressful situation a tad easier to deal with! John Colaianni is top notch and was with us every step of the way. We would absolutely request John for any potential future projects. And the dogs gave their stamp of approval! Thank you for being dependable and always communicating updates regarding the service to my roof. I told all my coworkers and neighbors about Nuss Construction...sometimes word of mouth is the best advertisement. Great work, on time and on budget ! Matt Thomas was super ! A tough job done well ! Well the bathroom is done and I just love it! In June I hired Nuss Construction in Marlton, New Jersey to do a complete bath construction. I had used Nuss on numerous jobs in my former home and was confident that they were the right ones for this job as well. They did not disappoint. John Colannini was my first contact and was very helpful in guiding me through the process. He kept all appts and on time along with returning any phones calls. He understood what I wanted and directed me accordingly. The forman on the job was Corey Jamieson. Cory was great to work with. He was always on time and on the job when he said he would be, he took care of all those little details that comes with a project such as this. Truthfully I am sorry that I do not have any other projects on the horizon since I would certainly hire them again. One more thing, I am a perfectionist and not easy to please, so if you happen to be as well, please do not hesitate to hire Nuss Construction. You won't be disappointed. We have had Nuss complete renovations in our Marlton house on three different occasions. First we had new windows put in our living room. The contact person, John Colaianni and installer, Corey Jamieson were so easy to work with and were experts in their jobs. Next we had our kitchen remodeled. Ron Vukicevich did all the work in the kitchen, from granite counter tops to backsplash and plumbing. He did whatever my wife asked! Last we had a leak on our back porch which was replaced by Matt Thomas another hard working individual. They work hard, clean up after themselves and are very friendly! You can't go wrong with Nuss! My experiences with Nuss have always been excellent. John and Hector have been nothing but helpful, it's a pleasure to deal with the whole Nuss crew. I recommend them often, and will continue to call on them for future projects. Nothing but satisfactions! Thanks Nuss! Our home is 18 years old now and we decided it was time for a complete remodel of our master bathroom. After soliciting several proposals, we decided to go with Nuss Construction. What set Nuss apart from the other contractors was the level of detail in their proposal. The detail in that contract gave us confidence that Nuss would deliver the project for the price they quoted. Where other contractors would simply show us a proposed floor plan for their design, our designer, Kyle Baptiste, showed us a 3D computer rendering of his plans. That really helped us visualize what the end product would look like. 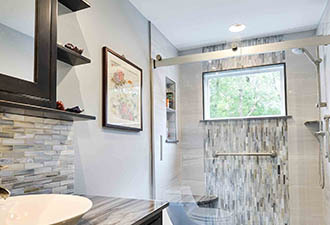 When time came to select tile, granite and fixtures, Kyle actually took us shopping to make sure we found products that would work in the design and stay within price point of the construction budget. During demolition and throughout construction, our project manager Mark Teears was onsite daily to make sure all work was completed to the highest quality and the job site was kept clean. Mark contacted us daily to let us know how the job was progressing. If there was any issue that came up with the work of any of the subcontractors, Mark made sure it was resolved. Nuss truly did a wonderful job. Between Kyle’s design and Mark making that design a reality, we couldn’t be happier with how the project turned out. How happy? 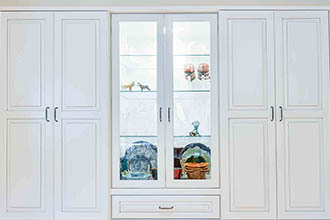 We have long-term plans for a complete remodel of our kitchen; Nuss will be the first phone call we make. I contacted Nuss when looking to replace the original roof on our Marlton home. I initially spoke with Tammy who was wonderfull! She scheduled Glenn Richards come to my home to inspect my roof which was leaking in one area in the attic. Glenn was so great to work with, kind and extremely knowledgeable. He arrived on time and provided me with a fast and fair quote. We quickly had the team out to remove the old roof and install the new one! Everything was done exceptionally well! After all the rain this winter I could not be happier that I took care of this with the help of Nuss! I am proud to support this great local, family-owned business! Kyle Baptiste was our initial contact. From the time we met him till the job was finished, everything was handled perfectly. All of your people were professional in every way -- so respectful of us and our home. We have already referred you to our neighbor across the street. Thanks so much for a job done well and in such a timely manner. You guys are the best. Though we are sorry that we had to contact Nuss Construction under the circumstances (water damage due to leak behind the wall), we are thrilled to have been able to work with your company. Dave Taylor and we go back 30 years, and he was just as professional and delightful in 2017 as he was in 1987! You have a rare person in Dave! Everybody else who came to our house showed the same courtesy and professionalism to us I wish we had something more "showy" and "glamorous" to showcase your workmanship, but we're just thrilled our damaged room is put back to right. Thank you for being such an easy company to work with! My deepest appreciation for the very fine work done to restore our front door to exactly what we had hoped for. I can't say enough good things about John Colianni who went out of his way I'm sure to accommodate our specific wishes and has made us very happy and relieved customers. Thank you! Thank You And Your Staff For The Great Reroofing Job At Our Fire Station. Bob - On behalf of the members of the fire company, I would like to thank you and your staff for the great reroofing job at our fire station. In particular, we would like to thank you and your staff for the additional work that was done repairing the roof at not additional cost. I was there watching your crew work and was amazed to see them finish the job in record time in spite of the threat of rain. Please pass on to your staff our thanks for a great job. Your Company Went Way Above My Highest Expectations. Your company went way above my highest expectations. We could not be happier. The personal attention received was incredible.